HI guys i'm new to the whole mazda 3 thing, i have a 2005 mazda3 ts2, and have seen the mps which has an aero kit? was just wondering if you could buy this seperately ad would it fit on the ts2? 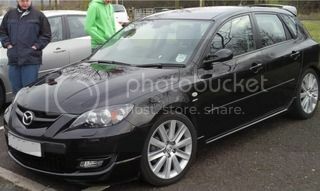 yeah it would fit the ts2, its basically a new larger spoiler... eaibach lowering springs and m3 style door mirrors, all of wich are things that mazda eaither offered for the standard car or can be fitted to the standard car! Isn't it also a different from and rear bumper and side skirts. i thought the skirts were the same but the rear skirt was diffrent?! I believe the skirts are the same all round. i thought so, the mps non areo and areo rear bumper is the same... its the rear skirt thats diffrent to the sport's isnt it?! Jward230 has a ts2 so would need both bumpers, side skirts, rear spoiler and aero mirrors to get the full aero kit look would he not? PS - I do hope that Jward isn't short fro Jedward!!!! Front bumper would not fit due to the MPS bonnet being different. ohh sorry i was listing the diffrence between the 3mps and the 3mps with the areo kit! The Rear bumper on the MPS is the same as the facelift Sport, although the MPS has the lower skirt fitted, and the diffuser section painted. Where as the on the Sport, the diffuser section is body coloured, and has a less sporty lower skirt. Its a lot of changes to transform a TS to a MPS. Fair bit of cash! guys if you read the original question he is just asking about the areo kit... all the parts are buy-able matey, i belive the doormirrors are arround the 300 mark the spoiler is arround the 200 mark and the springs are arround the 300 mark! Read it properly and he also asks if it will fit a TS2. yes and the door mirrors, spoiler and springs will fit a ts2! ! But where on earth are we to get hold of a rear aero spoiler?? ?